The Cuisinart CTG-00-MAN01 is a mandoline slicer which features ultra-sharp stainless steel blades. The blades are specially designed with same precision technology used to forge our food processor blades. The product offers up to 5 different cutting options, precision thickness adjusters, accessory tools that safely store right in the unit. The mandoline is an easy dishwasher cleanup. The Cuisinart Mandoline Slicer has many exciting features for users of all types. You can extend the lifetime of your Cuisinart Mandoline Slicer with the purchase of a FactoryOutletStore Factory Protection Plan. 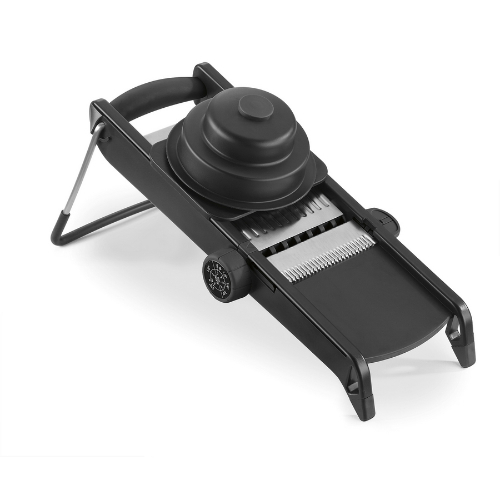 See the Cuisinart Mandoline Slicer product video and gallery images above for more details. The Cuisinart Mandoline Slicer is sold as a Brand New Unopened Item.